Throughout the 1930s workers of the flourishing entertainment industry of Hollywood had been organising themselves into unions. Stagehands, actors, directors, editors and writers had all successfully, albeit slowly, formed their own organisations through this massive drive for union recognition. By 1932, a union had been created for the so far unrepresented animation workers of Hollywood (although at this stage the organisation was referred to as a 'club' to keep it a secret from employers), whose members met in secret for the next several years, mainly out of fear of losing their jobs if their employers found out. However, after a successful strike was staged by animation workers in New York in 1937 forcing their employer to recognise their union, the Hollywood animators came out in the open, and announced the establishment of their branch of the Screen Cartoonists Guild (SCG) the following year. The SCG immediately began a campaign to organise all local animation workers, and by 1941 had obtained recognition contracts with nearly all of the major animation studios in the area with relatively little resistance from employers, bar an aborted six day long lockout at the Looney Tunes studio of Warner Brothers. However, the biggest prize in the eye of the SCG was the organisation of Disney studio's 800+ animation workers, Disney being by far the biggest employer of animators in the area. At this time the SCG had about 115 members, due to the small amount of people that were usually employed at animation studios, whether the animators of Disney studios would organise was to prove the making or breaking of this attempt to organise Hollywood's cartoonists. The cartoonists of the Disney studios were not the most poorly paid animators in Hollywood, however, there was discontent amongst the workers for several reasons. The first being the astounding inequalities in pay, for example, a top animator could be earning up to $500 a week, while a cell painter would be earning around $12. The second was the resentment that had surfaced against their employers during and after the production of "Snow White". The cartoonists had been promised large bonuses and pay rises upon completion of the film, which was expected to be extremely successful, and on this pretext had put in many hours of unpaid overtime, with one animator actually employing assistants for Disney out of his own pocket. The film was released to great critical acclaim, and made profits four times greater than that of the next most successful film of 1937, however, instead of receiving their bonuses as promised by the company, the cartoonists were met with a series of layoffs. Many of these seeming to target SCG members, or others identified as 'troublemakers' by the studio. To add insult to injury, the animators weren't featured in the credits of the film, with all credit going to the owner of the studios himself, Walt Disney. SCG continued to organise for the next few years, until another series of layoffs in 1941 prompted a meeting between Disney and his lawyers and American Federation of Labour (AFL) organiser Herb Sorrell, animator Art Babbitt and SCG president Bill Littlejohn. Disney refused to recognise the union, and maintained that the animators were represented by the 'Federation of Screen Cartoonists' (a sham union that had been set up by the studios and declared illegal by the National Board of Labor Relations). Following an angry exchange, Babbitt was fired along with 16 other cartoonists belonging to the SCG. Two days later, a mass meeting was held by the Disney employees where the motion to strike was put forward by an assistant to Babbitt and the strike was called by Sorrell to start the next day, May 29, 1941. Incidentally, Babbitt was one of the most highly paid animators in Disney's employ, but had a strong union ethos and was instrumental in keeping the strike going over the coming weeks. The next day, hundreds of men and women gathered on the picket lines outside Disney's studios, and quickly set up camp in a field across the street. Most of the cartoonists had observed the strike, including many who weren't union members. On the Wednesday after the beginning of the strike, cartoonists from the nearby Warner Bros. studios marched down to Disney dressed as French Revolutionaries of 1789 in a light-hearted show of solidarity with the strikers, and more often than not the strikers were often fed by union chefs from nearby restaurants, who when off-duty would come out and cook for the picketers for free. Every morning for the five weeks that the strike lasted, Walt Disney would drive through the mass of picketing workers at the gates of the studios, on one occasion leaping out of his car to attack Art Babbitt. Despite this incident, the strike was relatively peaceful compared to many other labour disputes of the time. The only other instance of violence (although it never materialised) being when a rumour went around amongst the strikers that hired thugs were to attack them, whereupon a group of Lockheed aircraft mechanics from nearby Burbank Airport, armed with wrenches were sent by Herb Sorrell to guard the strikers' tents. The strike began to take its toll on Disney, production on current features had been all but stopped completely, and he began to feel the damage being done to the studio by the strikers. Advised by friends to take a break away from the anxiety the strike was causing him, Disney left for a tour of Latin America five weeks after the strike had begun. In his absence the strike was settled by mediators, who ruled in favour of the SCG on every issue. The cartoonists received pay increases of nearly 50% in many cases, and have been union represented ever since. A labour practices suit filed by Art Babbitt also awarded him his job back after many years of legal wrangling whilst he was serving in the Armed Forces, which he returned to at the end of the war. Walt Disney refused to forget the strike, which he took as a personal betrayal on the part of his artists. In the following years he looked with suspicion upon the cartoonists he employed, and whenever cutbacks to the workforce were made, union members were the first to go. Those who stayed were treated badly and lost out on bonuses and pay rises. Later in the decade Disney was to be one of the first witnesses to testify to the famous House Committee on Un-American Activities (HUAC), which was investigating 'communist infiltration' in Hollywood and throughout the US. Disney testified that he believed communists had played a part in the strike, a conservative writer even going so for as to label Herb Sorrell, one of the strike leaders, as a 'soviet spy'. Subsequently, many of the animators involved in the strike were blacklisted by the HUAC, as were many actors and others involved in the film industry during the mass of anti-communist hysteria of the time. As well as being held in contempt by Walt Disney until the day he died, and the somewhat dubious privilege of being part of the Hollywood blacklisted, some of the strikers were also forever immortalised in the Disney feature Dumbo (which was in production when the strike occurred), caricatured as clowns at the circus who go to "hit the big boss for a raise". 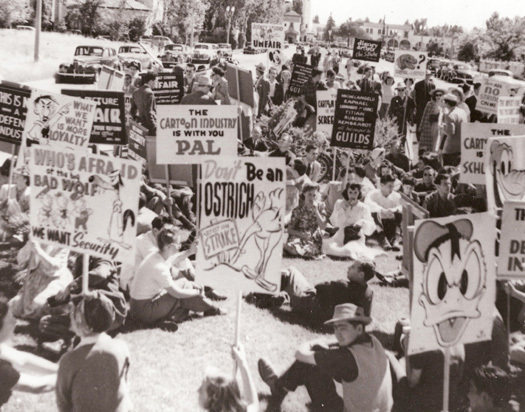 But however the Disney strikers are remembered, it will always be as one of the main driving forces behind the push for unionisation of the Hollywood film and animation industry in the pre-war years. I think this is an inaccurate thought. You have to go deeper into why people went on Strike, like he provoked them to go on strike because he was a racist man. Also you spelled Organize and Organization wrong. Also you spelled Organize and Organization wrong. What IS interesting is that I have been looking for information re Walt Disney Studios making of Dumbo and the struggle with the Unions and this has been the most useful so far - OK it doesn't go in great depth to the very heart of Disney's politics and how these affected the way he managed the studios - and it has always been to me a classic example of work that had such a profound effect on our childhood and still does and yet emanated from such a - if you will pardon the word - bigot. Its that discussion about can we seperate the artist from their politics.